Quantitative Risk Assessment (QRA) is a formalised specialist method for calculating numerical individual, societal, (employee and public) risk level values for comparison with regulatory risk criteria. Satisfactory demonstration of acceptable risk levels is often a requirement for approval of major hazard plant construction plans, including transmission pipeline, offshlore platforms an LNG storage and import sites. Each demonstration must be reviewed periodically to show that risks are controlled and reduced to an acceptable level according to applicable legislation and internal company governance requirements. 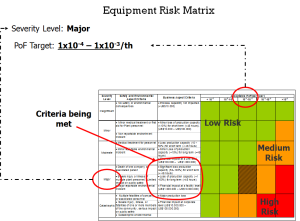 Risk evaluation can also help the decision-making process, in comparing the risks involved in alternative processes or layouts and can help optimise expenditure to improve safety. Quantitative risk analysis is the natural evolution of the traditional Discounted Cash Flow (DCF) method, moving the analyses beyond the static world. Investment projects in the oil and gas industry, where risk is plentiful, offer an abundance of examples of successful application of risk analysis. This method allows the identification of the key risk drivers underlying a project and the design and evaluation of risk mitigating strategies. Ultimately, decisions are based on the probability distributions on the project outcomes, their expected and extreme values, available mitigation strategies and remaining risks. A good quantitative risk analysis model is also the starting point of othet more advanced analyses common in the oil and gas industry, like value information (widely used in exploration and early production projects), optimization under uncertainly (used in refining projects, portofolio allocation and corporate strategic planning), and real options (complex production projects, expansion, abandonment and acquisitions). The challenges involved in any project are great, and utilizing the analysis that forecast not only risk, but risk’s probability, will enhance the ultimate success of any venture.